1) After many attempts, I have finally found a green smoothie that Norah loves. She asks for it everyday. It isn’t anything special but the combination was right for her: hemp powder, frozen peaches, 1 banana, 1tbsp chlorophyll, 2 cups spinach, and water. Who knew? 2) My husband is a creature of habit and, like Norah with her smoothie, wants to eat the same thing everyday for lunch. Bonus: it’s healthy and simple to make. 3) Thrift stores. It is like a treasure hunt and I’m always surprised with something. 4) This nifty contraption my husband made. I smile every time I use it. 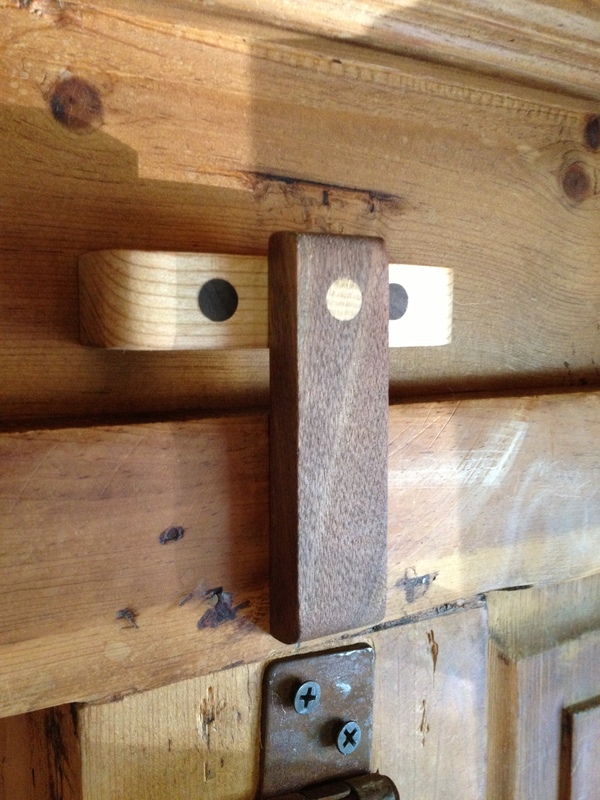 It is a latch that holds up our homeschool table. The original latch was prone to break and the table would crash down. Not to mention the wood came from my dear friend Abby in Vermont. Posted in Family, Food. Bookmark the permalink. I am so jealous that Norah will drink a green smoothie. Green is Suzi’s favorite color, yet there is hardly a green thing she will eat. Except raw broccoli, she doesn’t mind that. Thrift shops are my favorite too! And yard sales!